To secure a space in a class pre-payment of class fee required. Sat. July 16th and Sat. Aug. 20th from 10 a.m.-3p.m. Lunch break mid-day. Bring a lunch or go out. 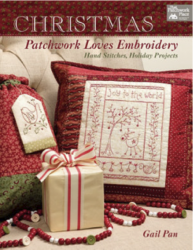 Embroidery and Redwork fans will love the many projects included in this book. Two of the ornaments will be made in the classes. Two Kits ($8.00 each) including wool, background cotton with interfacing, hanging ribbon and the book ($24.99) will be required for class. Additional supplies needed are needles, threads, scissors and a brown micron pen. All but the scissors available at Woolkeeper. Sunday July 17th-12 p.m.-4 p.m. 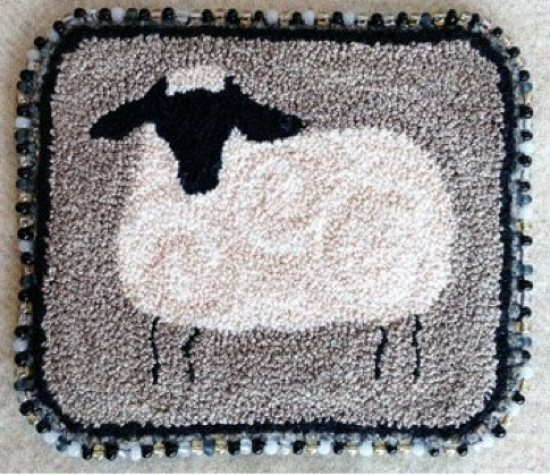 The beginner punch needle Kit includes the Sheep pattern, by Three Sheep Studio, drawn on weavers cloth, detailed instructions with photos to complete the design and Valdani Thread to complete the project. or mounted on a bag, board or box. Also included are instructions for finishing the project with wool backing and a beaded blanket stitch. Morgan no-slip hoop. I Suggest the Morgan Lap Stand Combo 7” and 9” Hoop. Available at Woolkeeper for $48.00. This class will fill up fast. If you asked to be on the waiting list for this class you still need to pre-pay to reserve your spot. 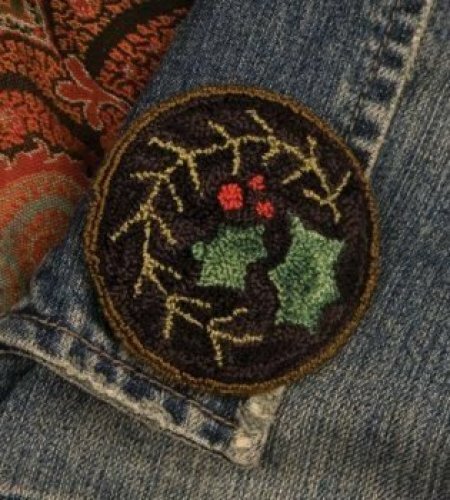 Holly Wear 2 ½” Round Punchneedle Embroidery by Threads that Bind. Saturday, July 23rd from 12 p.m.-3 p.m. If you already know beginning punchneedle techniques, this is a fun, fast, project for you. Turn this punchneedle piece into a lovely pin. Cover button, pin back and thread available at Woolkeeper. Bring your punch needle and hoop. 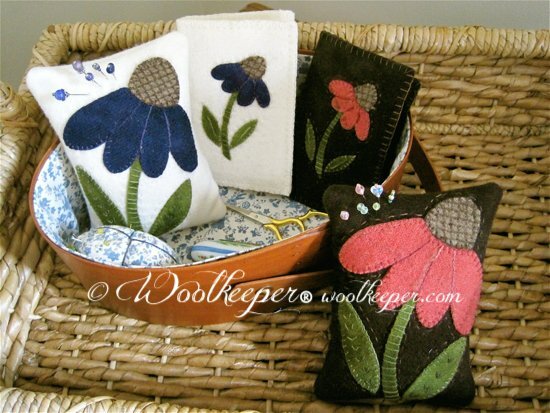 Beginning Wool Applique- Sunday July 31st -12p.m.- 4p.m. 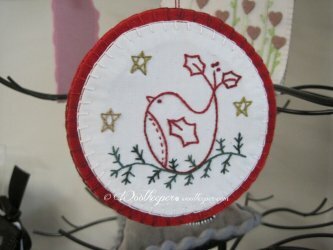 Learn the basic of wool applique by making The Echinacea Pin Keep and Needle Keep in either the pink or purple color way. Kit required. Kit may be purchased the day of class. In addition to the Woolkeeper pattern and wool kit, a kit with thread, needle and Heat N Bond Lite will be provided for you. You need to bring a pencil and scissors for cutting paper and wool.